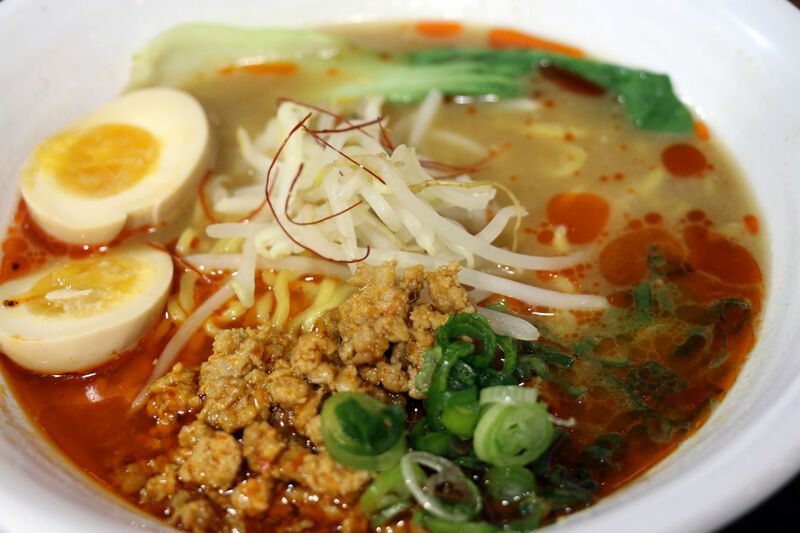 While ramen rages on throughout the Bay Area, Shiba Ramen, a little stand in Emeryville, is giving Ramen Shop and other noodle houses a run for their money. They are accomplishing this by serving up impeccable bowls of steaming, fragrant broth with chewy Sun noodles, carefully cooked meats and vegetables, and secret sauces that might make you jealous you don’t work there. And the plating is both fast and precise, a kind of architectural template for the perfect bowl of ramen. When we walked in the first time, pleased that the line was only 10 or so people long, I said to my wife, “It kind of feels like we’re in Tokyo, or some other actual city, not Emeryville” and she replied, “Yes, in a mall with housing.” And that’s exactly it. It’s hard to imagine planning to come here for dinner unless you happen to be on your way to a movie or have an appointment at the Apple store. Until you taste the ramen. Then, you start planning your next visit right away. The menu changes daily, rotating through a brief staple of signature dishes. We tried three bowls, each named after the broth that is their base: spicy, buttercorn and soy milk. There are also four different types of Sun noodles at the kitchen’s disposal: straight, wavy, dry and super-thin. The menu displayed above the counter is a bit confusing, as ingredients for each type aren’t listed, and it appears that you need to create your own. Luckily, that isn’t the case, and the printed menus floating about give you the lowdown. The spicy ramen comes with wavy noodles in a traditional tonkotsu bone broth made with pork and chicken and kicked up with sesame and shredded togarishi peppers that look like little slivers of saffron. Spicy pork, coarsely ground, is added in one quadrant of the bowl, bok choy in another, and the whole thing is sprinkled with green onions and bean sprouts. Floating on the side is a soft-boiled egg that’s been marinated in a secret tare, or sauce, that tastes like miso and soy, but that’s just a guess. 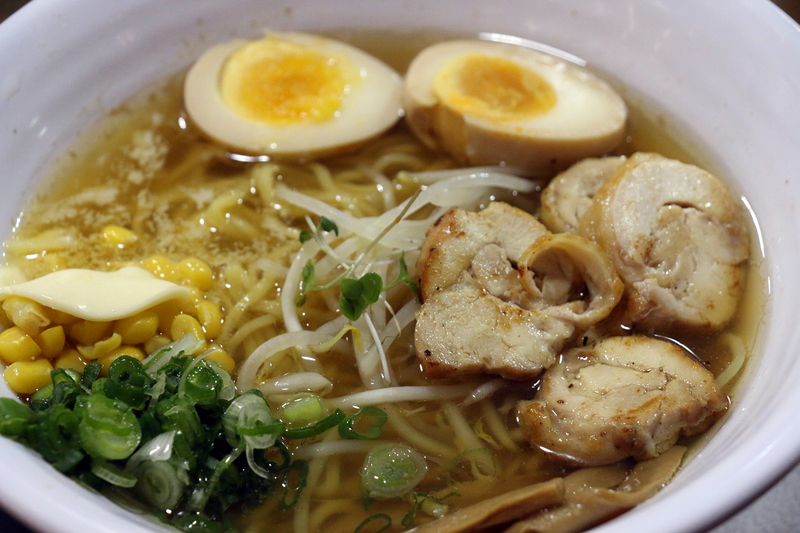 The buttercorn is made with a light, clear, deeply flavorful pork and chicken broth and straight noodles, topped with pork (or chicken) chashu (marinated and braised meat), bean sprouts, micro-greens, the aforementioned egg, and menma (braised bamboo shoots). This is the same recipe for what is called “clear” ramen up to this point; for buttercorn, you guessed it, butter and corn are added. The butter adds a creamy richness to the meaty broth, and the corn sweetens the whole dish. I was skeptical of the soy milk ramen, which is a vegan dish if you hold the egg, as I thought it might be too light without the pork that permeates the regular broth. I was happily wrong. 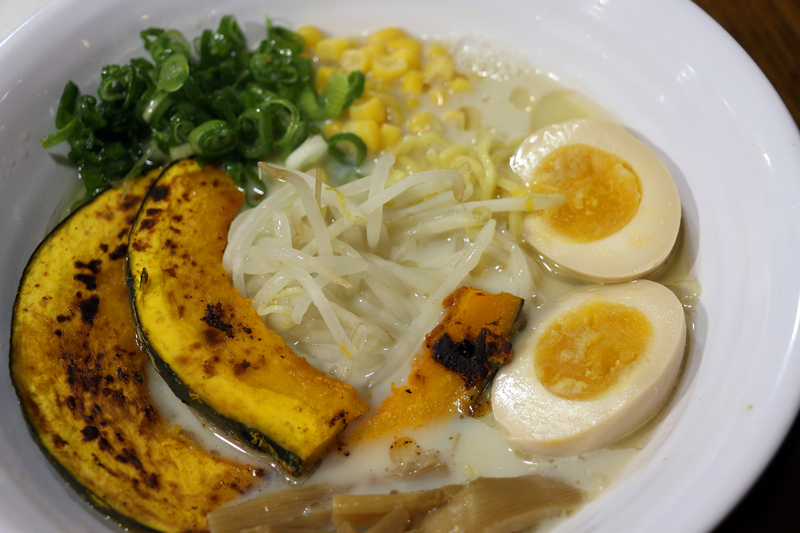 The soy broth is deepened with earthy vegetables, and the roasted kabocha squash placed on top adds a smoky nuttiness. This version is also served with straight noodles, bean sprouts, that wonderful, marinated soft-boiled egg, bamboo shoots, corn, and green onions. There are Japanese beers on tap, as well as a selection of local brews, and two lovely sakes on the drier side. All alcohol comes with weird mall rules: Beverages have to be opened for you at the counter, and you’re admonished not to leave the area with them in hand. 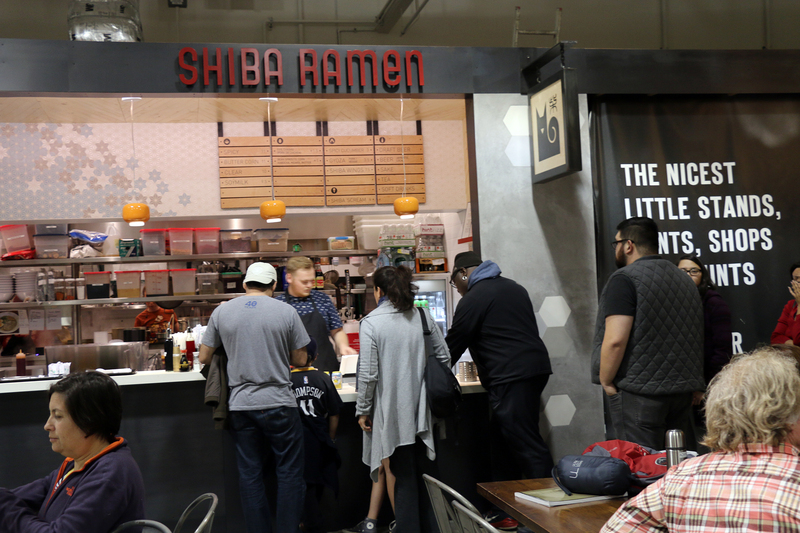 Shiba Ramen is so good, you don’t even need to invent a reason to go to Emeryville. Just show up.